If you’re a fan of Mickey Mouse you may already know that this famous mouse is celebrating his 90th birthday next month. That’s right, as of 18 November 2018 it’s been an incredible 90 years since Mickey made his first appearance in Steamboat Willie in November 1928. 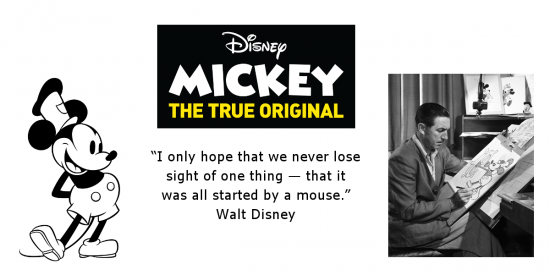 There will be celebrations taking place across the world to mark this special occasion, with South Africa also joining in to honour nine decades of Mickey the True Original. One can’t deny that Mickey has become a pop-culture icon, and a local design project where ten talented South African artists have added their own personal flair to 6-foot Mickey Mouse statues celebrates this. These incredible statues are part of the Mickey the True Original South African Exhibition which has already been showcased in Johannesburg and is now on its way to Durban (19 October to 11 November at the Expo Explore Court at Gateway) with Cape Town (16 to 26 November at the Canal Walk Centre Court) next on the list. The exhibition features four sections that highlight Mickey’s innovation, his evolution, influence on fashion and pop culture. I can’t wait to check it out together with my children in Durban! Look out for Mickey’s 90th Spectacular, a two hour special that will be on M-Net 101 later this year for musical performances, tributes and never-before-seen short films. There will also be special programming on 18 November across Disney Channel, Disney XD and Disney Junior so tune in for that too! Mickey Mouse inspired fashion, accessories and footwear will be available at Edgars, and also keep an eye out for new products, apparel, toys as well as books, arts and crafts and comics in stores this November and December. Samsung is on board with the celebrations too, and if you visit Samsung or Edgars store nationwide you can stand the chance to win a giant Mickey plush and an international family trip. Discovery Vitality members can also jump on board with tips on healthy food inspired by Mickey and a trip to Disneyland Paris up for grabs. What’s your favourite memory about Mickey Mouse? You can share your Mickey Mouse moments using #Mickey90Africa on your social media channels.